After our Dutch friends introduced us to poffertjes for the first time in the Jordaan district of Amsterdam, I was hooked. Now every time we go to the Netherlands, we make sure to indulge in poffertjes at least once. But the thing is, we don’t visit Amsterdam that often. Lately, it’s been a once-per-year occasion, if that, which means that my life is seriously lacking in the Dutch sweet treats department. Since then, poffertjes have become one of my favorite things to make — whether for breakfast or a late-night snack! Oh, and if you aren’t familiar with poffertjes, then allow me to explain. 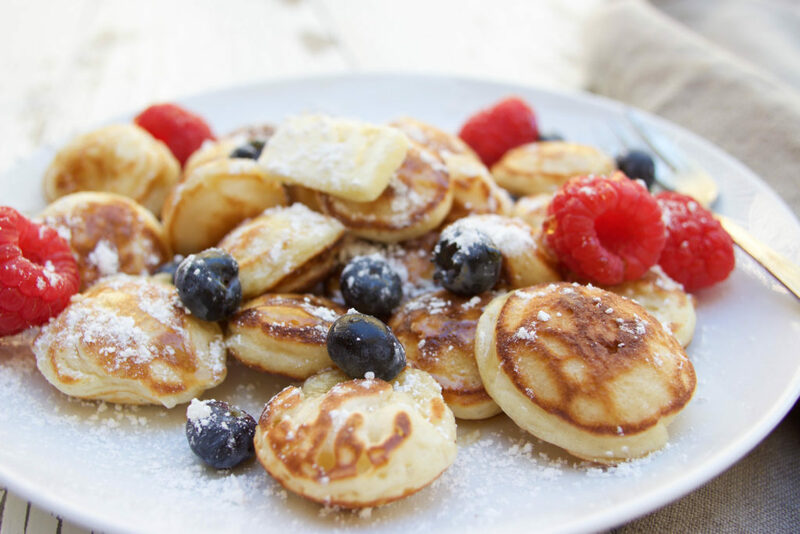 Poffertjes are essentially like mini American pancakes — only they are super light and fluffy, spongy, and cute, and so very Dutch. (And about 20 times more delicious.) They’re typically served with butter and powdered sugar, but of course you can put on whatever toppings you like! Today, I’m putting on all of my favorite accompaniments: powdered sugar, butter, maple syrup, and some vibrant berries for some freshness. Have I sold you on making your own poffertjes yet? Great. Let’s get to it! The ingredients necessary for this poffertjes recipe are pretty standard. I’d bet that you have them all on hand right now. On the other hand, you probably don’t have the equipment necessary to make poffertjes. That’s my guess anyway! To make poffertjes the proper way, you will need a poffertjes pan. The poffertjes pan allows the pancakes to take their typical round shape, allowing for their fluffy texture. 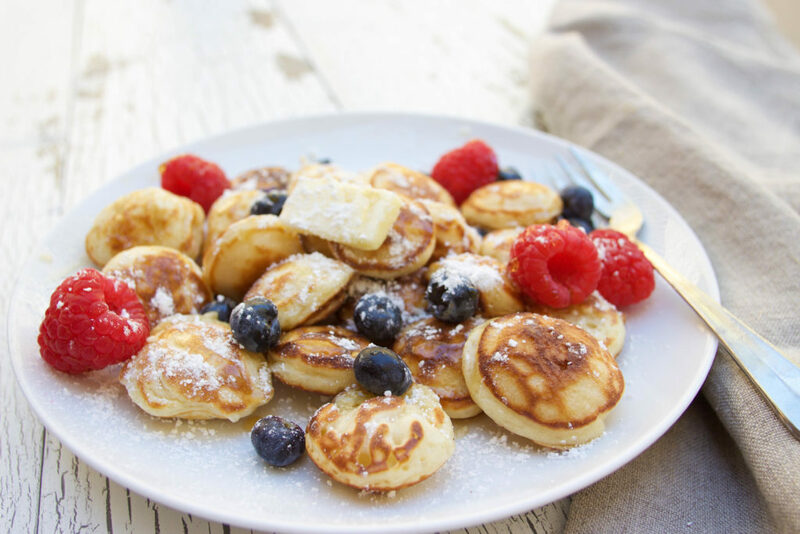 You could try to make poffertjes in a regular pan, but you just won’t get the same results (you’ll end up with denser American-style pancakes instead). For only $15 on Amazon, it’s a good idea to purchase your own poffertjes pan. You will love these sweet treats so much, you will make them again and again. I’m sure of it. 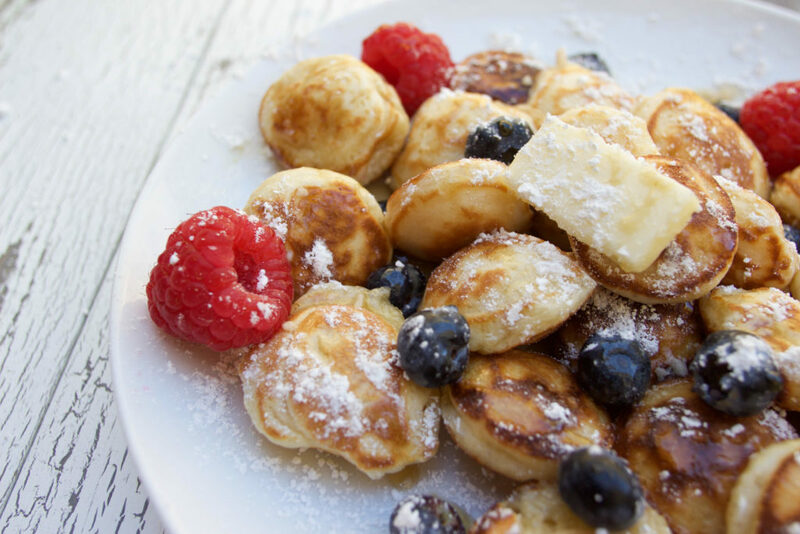 I know that you’re going to love this poffertjes recipe. Every time I make them, the poffertjes bring me right back to the canals of Amsterdam — and that’s not such a bad place to be, eh? These fluffy little delights are everything you want in a sweet treat, and so much more. Their light, spongy texture, paired with salty melted butter and sweet powdered sugar really hits the spot. Every single time. In the microwave or a pan, heat milk until slightly warm (just above lukewarm). Then, in a small bowl, mix together the milk, sugar, and active dry yeast. Set the mixture aside for 10 minutes, until mixture looks bubbly and foamy. Meanwhile, in a large mixing bowl, combine flour and salt. Add the egg and the liquid mixture to the dry ingredients. Mix with a hand whisk or an electric mixer until you have a smooth, silky batter. Cover with a clean, damp cloth and set aside for one hour, or until the batter has about doubled in size. Transfer the batter into a piping bag or a squeeze bottle. Grease your poffertjes pan with butter and heat it over medium heat. Once the pan is hot, fill up each poffertjes mold with batter, then cook each side for one minute, using a fork or butter knife to flip. 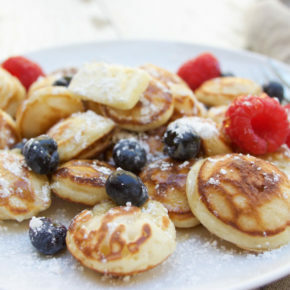 Serve your poffertjes hot, with butter, powdered sugar, and any other toppings you wish! If you don't have a piping bag or a squeeze bottle, you can simply use a spoon or an ice cream scoop. However, these options are a bit messier! If you do not use a poffertjes pan, then your poffertjes will more resemble American pancakes. They will lack a thicker shape and fluffy texture, which is what makes them special! 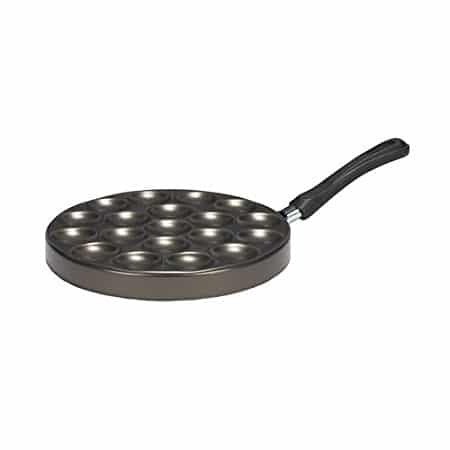 If possible, purchase this poffertjes pan. I use 2% milk, but you can use whatever kind of milk you have on hand: skim, 2%, or whole. 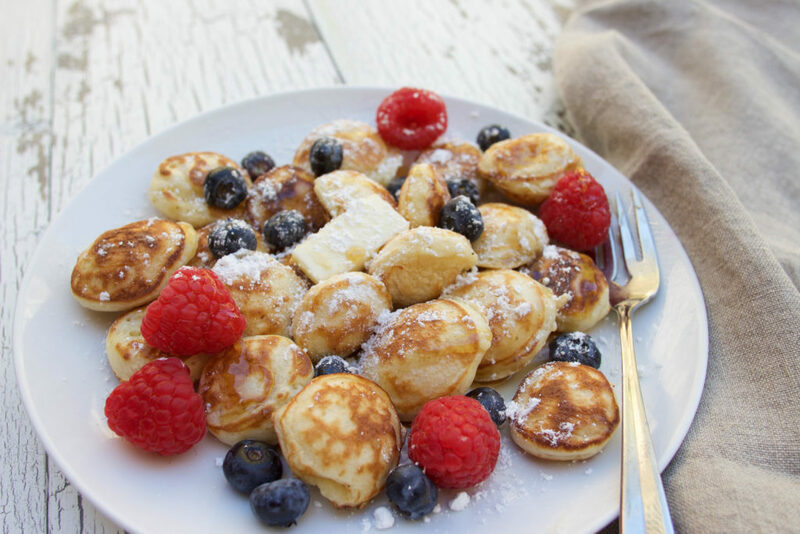 If you try out our poffertjes recipe, let us all know how it went in the comments below. 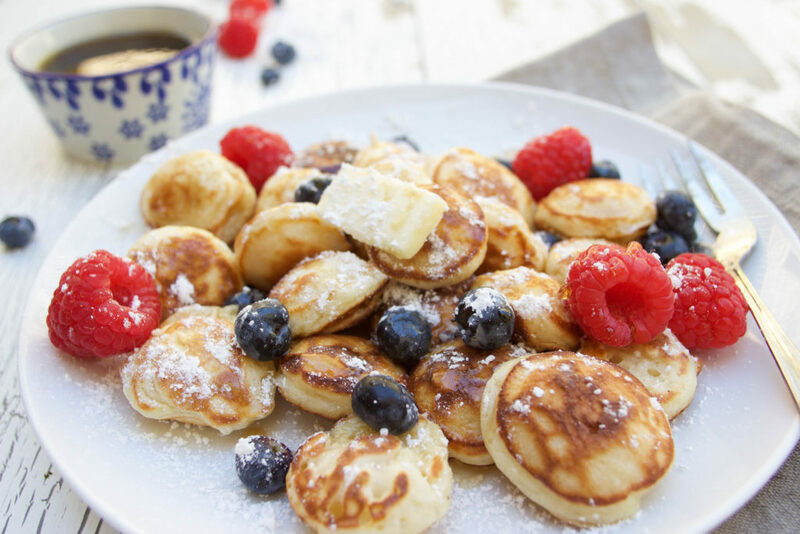 If you post a photo, tag @travelalphas so we can see your poffertjes! Also, if you have any questions, leave them below. I am Dutch and I never eat poffertjes! LOLz. I do like them a lot, but for some reason we always choose pancakes over poffertjes. Looooove poffertjes! Eat the once a year at our local, Orange City,Is Tulip Festivale. A special group of people make them in the “Little White Store” every day during our 3day celebration of our Dutch heritage!